Rich in detail and topographical terrain, our Gallery Wrapped Canvas Teal Dream World Map with Pins has it all! The calming ocean colors of this teal map subtly show off the beauty of the ocean depths, while the lighter continental colors make the terrain and cities stand out, giving this map a unique look and feel. This Push Pin Travel Map is highly detailed, with country capitals listed and all 50 US states labeled, making it a breeze to pin your US travels as well. See if you can pin every state! Antarctica has been removed to provide the most amount of pinnable space. Our own exclusive design, this frameless gallery wrapped canvas map, with its rich canvas texture and modern frameless design, will add a sophisticated style to your home or office. Reminisce about past travels and dream of future adventures with this gorgeous gallery wrapped travel map! Add the optional personalization to your travel map and have your text printed directly on the map itself, giving you a one of a kind work of art. 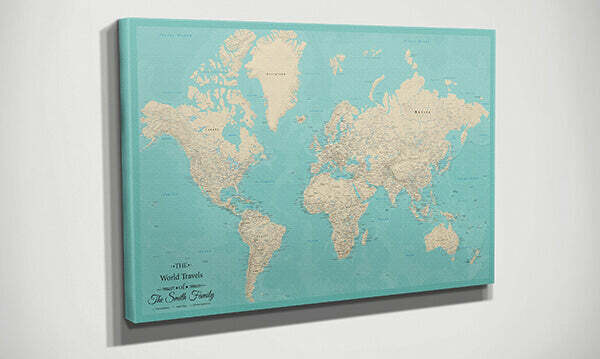 Our Teal Dream World Map on canvas also makes a unforgettable gift for any traveler in your life! With clean modern lines due to its frameless design, our Gallery Wrapped Canvas Teal Maps draw all the focus to the beauty of the map itself, creating a timeless interactive art piece you will be proud to show off to friends and family for many years to come. 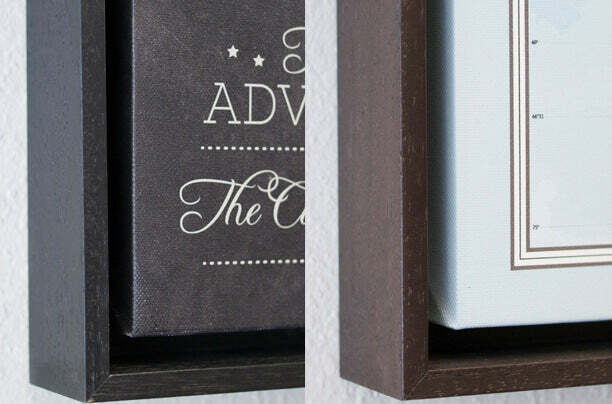 Our Frameless Canvas Maps are printed on premium canvas for an upgrade that will give you a rich, textured look and feel that ensures your map will stand out prominently wherever it is hung. Each canvas map is printed in house using our fancy-schmancy latex printer which creates a vibrant print that truly looks like a work of art! Did we mention that our Canvas Pin Maps make the perfect 2nd Anniversary Gift idea, which is traditionally the Cotton Anniversary? Pin where your love has traveled on your personalized Gallery Wrapped Canvas Map! Excellent quality. Great customer service. We are very pleased with our purchase and will recommend to friends and family. Have received my customized pin map within a week. Great quality - worth every $. Very happy with this purchase! We couldn't wait to hang it when it got delivered. Once it was hung we had a great time putting our pins every place we have. The service and quality is great and it came with in a week. Stunned and delighted by the speed with which the map was delivered. Plus, I'd ordered it personalized! I received it in pristine condition able to surprise my husband on his birthday. He beamed happily, and promptly pondered where it could best be displayed.